Cilia are found on the surface of a large number of cells and beat together in waves to move objects, such as to remove particles and mucus from the windpipe and lungs. In this manner, cilia protect the respiratory system from pathogens that can lead to infection. The structures that make-up the cilia are also found in the flagellum or tails of sperm. Primary ciliary dyskinesia (PCD) is an inherited disorder of the cilia that can be found in the Old English Sheepdog. In PCD, affected dogs have cilia that do not function properly. Fluids cannot be moved in the respiratory tract and can lead to infection. Symptoms include coughing, sneezing, nasal discharge and frequent respiratory infections. Affected dogs may be sterile due to the inability of the sperm to swim properly. Genetic testing of the CCDC39 gene can reliably determine whether a dog is a genetic carrier of primary ciliary dyskinesia (PCD). Carrier dogs do not have features of the disease but when bred with another dog that also is a carrier, there is a 25% risk of having affected pups. Testing should be done PRIOR to breeding so that carriers of this disease are not bred together. 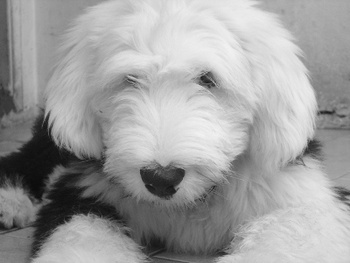 Screening should be done PRIOR to purchasing an Old English Sheepdog puppy to identified affected puppies that are at a higher risk of respiratory infections and infertility.